The 130cm Sherpa was designed in 2007 after the Spruce 120 had been in the market for two seasons. 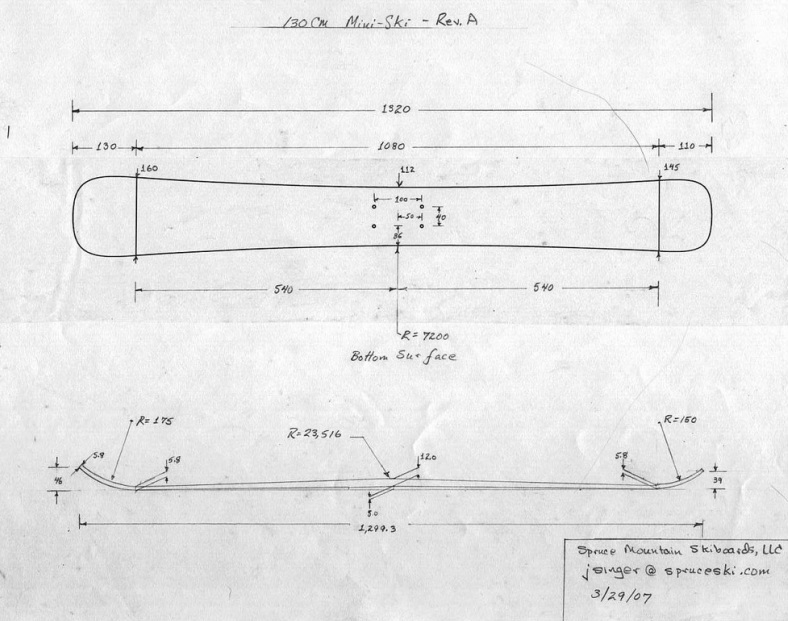 The main objective of this design was to make a board that would have high performance in all snow conditions and that could be ridden hard at high speed with excellent stability. The wide shovel at 160mm provides extra float in deep powder and coupled with 15mm of tail taper to 145mm, allows the board to sink at the back without leg strain. Because the board is of medium stiffness, it holds exceptionally well on ice and is able to power through chopped up snow without the rider having to pick a line. As an all conditions board, it is best suited for riders weighing 190 pounds and above, although lighter riders down to as little as 130 pounds can take advantage of the board's size for deep powder days. While it's not shown on the dimension drawing, the board has a bit of rocker at the tip and tail (5/110) which makes turn initiation and tightening a turn radius easier than it would otherwise be. Here are the 2016.17 Sherpas with the mountain scene graphic. These are currently in stock.